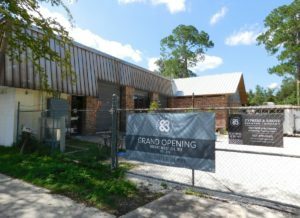 Two years in the making, Gainesville’s newest craft brewery is throwing a grand-opening celebration on Saturday in a building that once housed the city’s first ice plant. Sally Adkins knew that Patrick Burger had a love affair with craft beer long before they crafted a love affair of their own. “On my first date with him, he woke up at 6 a.m. so he could brew beer before we went on a bike ride,” she said. That was in 1999. 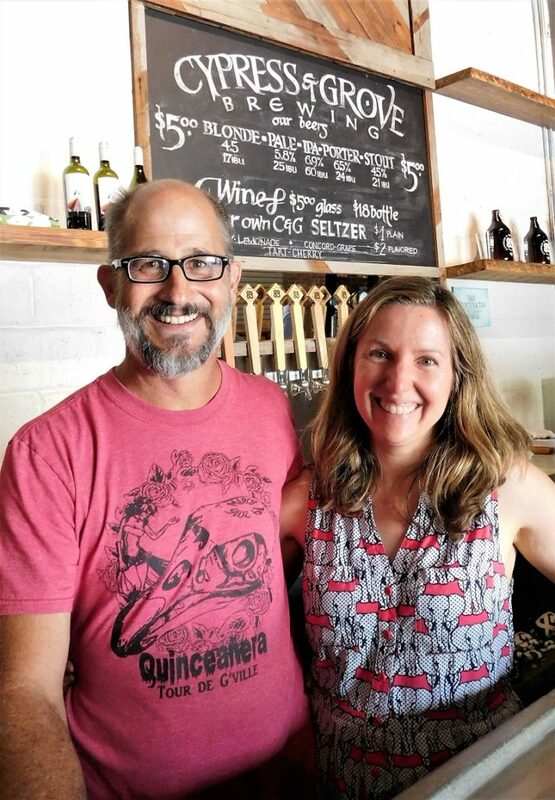 Almost two decades later, Burger and Adkins are a happily married couple, but Burger’s passion for craft beer is as strong as ever. “It’s always been a pipe dream of his to open a brewery,” Adkins said. On Saturday, the Cypress & Grove microbrewery celebrates its grand opening from 3-10 p.m. with locally brewed craft beer and craft seltzer as well as live music by Michael McCarthy and food trucks from Cilantro Tacos, Reggae Shack and Jodi Cannoli. The event will also mark the opening of the brewery’s tasting room, known as The Brick Room. 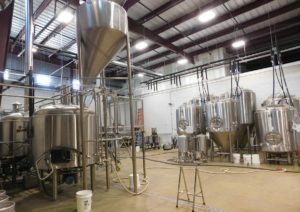 The brewery has been open on weekends for the past two months but will now expand its operation from Thursday through Monday. On Friday, workers were busy hooking up lights and installing glass doors in the Brick Room and putting finishing touches on other areas of the spacious brewery at the corner of Northwest 4th Street and 10th Avenue, which in the old days was the corner of Cypress and Grove streets, thus the inspiration for the brewery’s name. Burger had planned to call the business Rainstorm Brewing Co. but there was a naming conflict with another brewery. Burger and Adkins are partners in Cypress & Grove with another husband-and-wife team, Gary Heil and Anna Heineman. Heil’s interest in craft beer took off several years ago when his wife bought him a home-brewing kit. Heineman’s grandfather helped rebuild Munich’s historic Hofbrauhaus following World War II. Burger is a civil engineer who specializes in groundwater hydrology for the St. Johns River Water Management District. Heil is a microbiologist at UF. Adkins coordinates the Clean Water Partnership for the City of Gainesville, while Heineman is an art historian. When the two couples took over the dilapidated Ice House property in May 2015 and announced plans to build a craft brewery, the task seemed overwhelming, if not impossible. There was little left of the roof and trusses from the old structure, and the flooring had to be replaced literally from the ground up. One area of the building required 93 yards of concrete to be poured. “Now it’s clean and shining and beautiful with lots of help from our community, our friends and our families to restore it back to its original glory,” Adkins said. Adkins said the goal is to make Cypress & Grove not only a popular brewery but a place where people can meet and exchange ideas in much the same way novelists J.R.R. Tolkien and C.S. Lewis built a beautiful friendship over delicious brews at a hometown pub in Oxford, England. “That would be our inspiration, for people to discuss ideas and relax,” Adkins said. Cypress & Grove currently offers six of its own craft beers on tap — a blonde, pale, IPA, porter and stout, with an American wheat beer added this weekend for the grand opening. Each sells for $5 a glass. Customers can also purchase beers on tap from Swamp Head Brewery and First Magnitude, Mother Kombucha from St. Petersburg as well a variety of wines and locally made seltzer in three flavors. According to Burger, Cypress & Grove has a 15-barrel brewhouse, meaning it can produce 450 gallons of beer at a time. There’s also a 90-barrel fermentation space and a walk-in cooler that can store hundreds of kegs at a time. The brewery’s large Brick Room tasting area is built on the site of the original Ice House building from the 1890s, when ice was brought to Gainesville by railroad and stored. 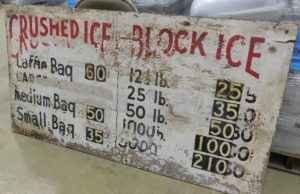 The heavy ice blocks were once rolled into the building and up a ramp on a trolley line. Doug Porch, general contractor for the Cypress & Grove project, replaced the steep ramp with six steps that lead up to the Brick Room. 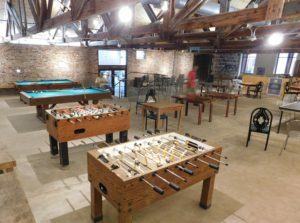 Customers now can enjoy two billiard tables, two Foosball tables and a ping-pong table in an area where blocks of ice were once stored. Other tables in the room are made from heart-pine lumber that was once part of the roof structure. For further info, visit the Cypress & Grove website or follow the brewery on Facebook.